This post is a bit like a reverse of An Introduction to Converting PowerShell Scripts into WFA Commands! I’ve written a load of CDOT Synchronization commands that run in WFA, and form complete synchronization workflows. But, I want to be able to test, tinker, and perfect every CDOT Synchronization command, outside of WFA, before they are let loose on production systems. And I don’t want to have to maintain two pieces of code, one for inside WFA, and one for outside. Replace the contents of $Username and $Password with an account and password that has sufficient permissions to your CDOT clusters. Then grab the code from WFA, paste into a text editor and save as WHATEVER.ps1. Then simply run that script including all mandatory parameters. 1) Connecting to Source Cluster = PRCLU01! 2) ONLY READ the Cron Schedules from PRCLU01! 3) Connecting to Destination Cluster = DRCLU01! 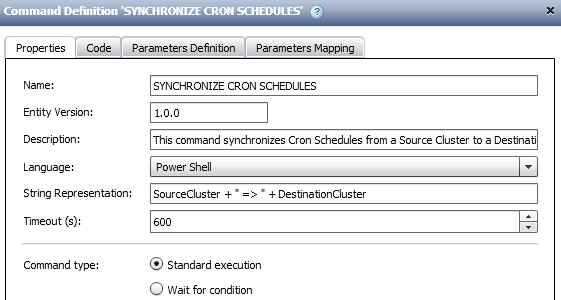 4) Add Cron Schedules that don't already exist and/or set them correctly. 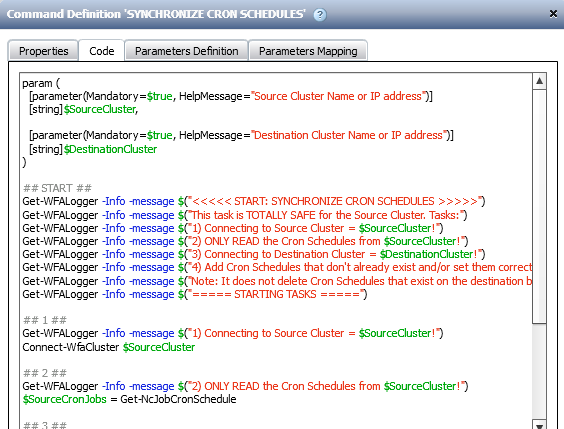 Note: It does not delete Cron Schedules that exist on the destination but not the source!